Sinopse: In the distant future, Earth has been devastated and its inhabitants seek a new home in the heavens. However, constant warfare forces humans to return to Earth, which has turned into an uninhabitable planet except for a certain area called the Divine States. The Divine States are too small to accommodate all the humans, so they duplicated the area and created the Harmonic Divine States. In order to retrace their steps and rediscover their journey to the heavens, the returned humans began to reproduce history from the year 10,000 BC, using a mysterious history book called Testament. History reproduction proceeds smoothly until A.D. 1413, when a war broke out in the Divine States. This causes the Harmonic Divine States to crash onto the original world. The humans living in the Harmonic Divine States lose their land and invade the original world. The people of the Divine States surrender and they are divided by the invaders from the Harmonic Divine States. They try to resume the reproduction of history from A.D.1457, but the update of history terminates in A.D.1648. A rumor of apocalypse begins to spread around the world. Why? : Because my dream will never die. Someday I'll see this licensed in some language I can read or simply give up and buy the Japanese version. This one is in the list of novels I need to read before dying. The anime was great (if you can understand the story), and I can only imagine that the novel is even better. This is one would be hard to license with the current model of JNC since each volume can reach up to a 1000 pages even in the Japanese book. Hell, you can hardly call it a "Light" Novel with that many pages. To give you guys an idea on how thick it is here is a picture. 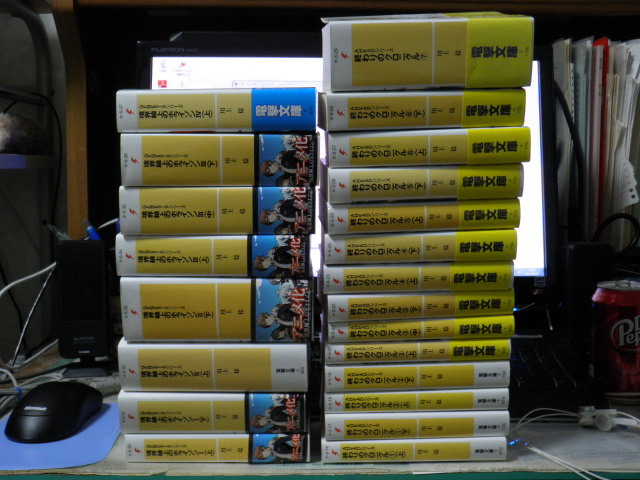 Left Pile of books is Horizon and the Right Pile is Owari no Chronicle a.k.a the Prequel of Horizon. Although, I would still love and buy it if it would ever be licensed by JNC and only JNC so at least they could translate it as fast as they usually do. Recently became a member here so I could read JK Haru, but i'd kill for Horizon being licensed. Literally one of my favorite novels of all time, and I can really see it getting a premium release. I've heard good things about this hope it gets picked up. I would like to hear what Sam would do for a series of this scale. @hyferzftw I've thought a lot about it but can't really think of a way that's viable aside for some kind of patreon-esque model for maintaining an ongoing translation. I mean if it was going to be a massive seller sure but I can only see this being kind of a middling seller and that's not going to support the massive undertaking publishing it would be in the end. Maybe I can come up with something and convince Japan to go with it that would at least hedge the risk a little. This series (and the related series such as Owari no Chronicle) are all fairly massive. Of course, looking at the related anime/manga and such might be another way to gauge interest, but that is kind of old at this point. It would definitely be amazing to get this in the bookstores, but with this kind of series, it is not something you'd easily translate and if translated poorly, it won't be fun to read. The issue I had with the Anime is it felt like I was missing a whole lot of it. It appeared to have what I call "Massive Symbolism Overload". There appeared to be so much symbolism riddled throughout all of it that I felt truly lost during half of the series since I was not familiar with most of it. There wasn't enough context given with the Anime so I felt the Anime would have been more enjoyable if I read the books before watching it. I would read this if it was translated but I have a hard time getting pumped up about it due to my experience with the Anime. Prequels also help a lot with that, but generally Anime cuts and compresses the story quite a bit. That and since this isn't the first one in the series, it gets a lot harder to understand if you haven't at least read Owari no Chronicle. Well let us hope one day it gets a transition for now. I´ve checked the fan-translation of it and its well traslated and was surprised from 1000 pages(JP) to 400 pages (EN) like whaaa?? @theredjet Ever watched Lost in Translation? I always thing back about the minute long dialog the director of the commercial said and then the translator just said 2 sentences. I would love love love these to come over. I would Patreon, Kickstarter, pre-but/ whatever it takes. I wonder about breaking each volumes into smaller parts (like Faraway Paladin 3 did) so each Japanese volume would become 2-4 American volumes. That way there’d be more income per volume. @the-green-death Paladin vol.3 was split into 2 books in Japan though. @doublemangekyo Yeah but it was still pretty much half a novel for each volume. I’m almost certain that long English books get split into multiple parts for Japanese release so I don’t know why the opposite couldn’t happen in reverse. E.g. Koyomimonogatari is being released as 2 parts. So, don't think it can't happen.